Turkey's Operation Euphrates Shield has allowed 140,000 Syrian refugees to return to their homes, clearing the Daesh terrorist organization from the northern Syrian towns of Jarablus, al-Rai, Dabiq and al-Bab. 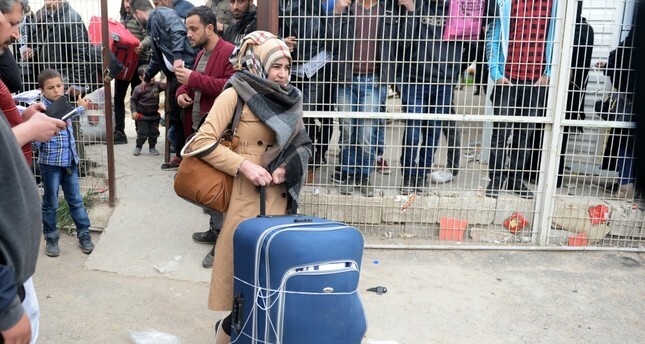 More than 160,000 Syrian refugees have returned to their homes in northern Syria, where Turkish military interventions liberated a number of key towns and cities from the PKK's Syrian affiliate, the People's Protection Units (YPG), and Daesh. Deputy Manager of the Interior Ministry's Immigration Authority Abdullah Ayaz said around 162,000 Syrian refugees have returned to the areas liberated in Operation Euphrates Shield and Operation Olive Branch. Speaking to Anadolu Agency (AA), Ayaz said that following the successes of these operations, Syrians are returning to their hometowns in more numbers. He added that currently there are 3.57 million Syrians living in Turkey. He said that they were expecting even more people to return in the near future. All the departments of Interior Ministry are working to make Afrin a livable place and enable more Syrian families to return homes, Ayaz said. "We have prepared a list of the Syrians who are volunteering to return to Afrin. We told them that we will contact each one of them and provide them with the necessary support and convenience," Ayaz said while underlining that as the Immigration Authority they were also doing their best regarding the issue. On March 18, Ankara announced that Afrin was cleared of YPG terrorist elements, but the Operation Olive Branch, which was launched on Jan. 20, still continues as the Turkish forces continue to clear mines and other explosives planted by the YPG before they fled rural area in the region as well as the town center. Turkey now plans to hand Afrin over to its residents and establish an administration there. It would take demographic sensitivities into consideration in the governance of the province until a new government is established in Syria. It also decided to request the disarmament of the public and form a security force that is not aligned with any party. The most important criterion that will help secure the future of Afrin is that anyone who has had an affiliation with the YPG or the PKK will not be allowed to take part in the administration of the province. Meanwhile, Turkey launched Operation Euphrates Shield on Aug. 24, 2016, to clear Daesh terrorists from northern Syrian towns of Jarablous, al-Rai, Dabiq and al-Bab. Following the successful operation, more than 140,000 Syrian refugees have returned to their homes in the area. Pointing at some of the problems caused by the lack of infrastructure, Ayaz said that in order to compensate for these issues they launched a project named, "Updating the Records of Syrians," in January. "We have updated the records of 1.5 million Syrians. With this project, we will have a healthier database. We will be able to share these data with the relevant institutions and individuals. If there would be no misfortunes, we are aiming to complete the project as soon as possible and have all the details of the Syrians [who live in Turkey]," Ayaz said while emphasizing that the project will enable them to evaluate the human resources more efficiently. Ayaz also condemned fake news on social media regarding Syrians and other asylum seekers in Turkey. He reminded news claiming that the phone bills of Syrians were being paid for by the government, they were being paid salaries, the Turkish state was buying them houses or the Syrians were able to get into universities without an exam, were all far from the truth. "The phone card scheme we have launched is being paid for by the European Union. It is targeted at the irregular migrants who stay at Repatriation Centers so as to enable them to get in contact with their own consulates. But some media outlets portrayed it as if we were paying the phone bills of Syrians," Ayaz said about the misinformation. "In addition, there are other claims that they will get houses or will be paid a salary. None of these are true. No salaries are being paid to the Syrian refugees," he added, highlighting that in order to have a house from the Turkish government-backed housing agency, TOKİ, one needs to be a Turkish citizen. Regarding the news on getting into college without an exam, Ayaz said that the Syrians were subject to the same procedures required for any other foreign students.